As always when rating anthologies, you have to try to find a happy medium, which is why I'm giving Monsters Exist four stars. There were a few stories that, on their own, would have merited five stars, but then there were also a few others that didn't impress me so much, so I've taken a middle ground. I should say straight up that I am not much of a horror reader these days and if the theme hadn't grabbed me when the review request came through, I'd probably have declined. 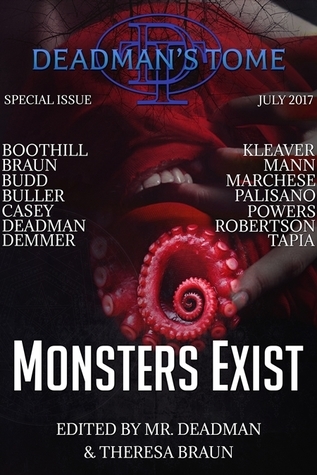 In the end, I'm glad I did accept as I found Monsters Exist to be an interesting collection with many different takes on the brief. None of the tales scared me to a huge extent; however, several were certainly creepy and stuck with me for a while after reading them. If this is a genre you like, I would definitely recommend giving the anthology a try--just keep your hands and feet well tucked in under the covers when you turn off the light!